Researchers at Toyohashi University of Technology, in cooperation with researchers at Teijin Pharma Ltd. and Teikyo University, have highlighted the possibility that chirality of vitamin-D derivatives can affect the protonation states of histidine residues in the vitamin-D receptor protein via ab initio molecular simulations and biomedical analyses. This finding emphasizes that protonation states should be considered more precisely in molecular simulations, when investigating specific interactions between candidate drugs and target proteins related to disease pathogenesis. Vitamin-D is recognized to play many important roles in the onset of immunological diseases, as well as the regulation of calcium level in the blood. These physiological actions caused by active vitamin-D are triggered by the specific interaction of active vitamin-D with the vitamin-D receptor (VDR); many types of vitamin-D derivatives have been developed as potent ligands against VDR. The binding affinity between human VDR and vitamin-D derivatives has been reported to depend significantly on the chirality of the derivative. However, the reason for the dependence has not been clarified, which makes it a bottleneck in the development of novel and potent drugs against immunological diseases, whose onset is related to the activation of VDR. Now, researchers at the Department of Computer Science and Engineering at Toyohashi University of Technology and at Teijin Pharma Ltd. and Teikyo University have demonstrated the possibility of the chirality of vitamin-D derivative to affect the protonation states of histidine residues in the VDR protein based on the results evaluated by state-of-the art molecular simulations and the K computer of RIKEN. Researchers have observed the specific interactions between VDR and some vitamin-D derivatives with different chiralities using ab initio fragment molecular orbital (FMO) calculations. The FMO results reveal that two histidine residues in the VDR contribute significantly to the binding of the VDR with the derivatives and that the protonation states of these residues can affect the specific interactions. Therefore, the researchers considered the other possible protonation states of these histidine residues and determined the most stable states using the ab initio FMO calculations. The results illustrated, for the first time, the possibility that the difference in the chiralities of vitamin-D derivatives can induce changes in protonation states of the histidine residues in the VDR that exists near the derivative. Due to this change in the protonation state, the derivatives can bind more strongly to the VDR and can thus produce more stable complexes with it. This finding provides an important and essential warning for the molecular simulations to consider protonation states of histidine residues in proteins more precisely while investigating the specific interactions between proteins and ligands. "We have used sophisticated molecular simulations and the K computer to find that the protonation states of the histidine residues in the VDR change significantly with alterations in the chirality of ligand", explains Associate Professor Noriyuki Kurita, "Since histidine residues exist in many proteins involved in the pathogenesis of diseases, we should consider their protonation states more precisely via in silico drug design based on molecular simulations." The first author, graduate student Yuta Terauchi, said, "Our final goal is to develop novel and potent drugs capable of activating VDR based on our ab initio molecular simulations, as well as on the basis of biomedical studies performed by our collaborators." The authors are participating in an in silico drug design consortium – the fragment molecular orbital drug design (FMODD) consortium – in which various researchers from universities, drug companies, and national institutes are investigating the specific interactions between disease-related proteins and many types of candidate drugs using ab initio molecular simulations based on the FMO method and the K computer. 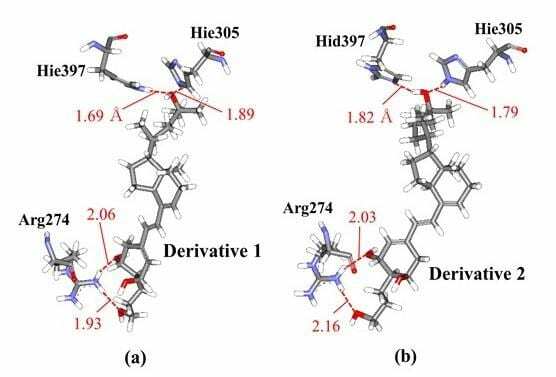 Similar molecular simulations are underway now for a huge number of vitamin-D derivatives in order to propose novel ligands for VDR, which can act as candidate for potent drugs against immunological diseases, such as cancer. A part of this research was undertaken during activities of the FMODD consortium. A part of the results was obtained using the K computer (project ID: hp170183 and hp180147). Yuta Terauchi, Rie Suzuki, Ryosuke Takeda, Ittetsu Kobayashi, Atsushi Kittaka, Midori Takimoto-Kamimura and Noriyuki Kurita (2018). Ligand chirality can affect histidine protonation of vitamin-D receptor: ab initio molecular orbital calculations in water. Journal of Steroid Biochemistry and Molecular Biology, in press.